On Platform 3 at Wansford Station is the old station building which was built in 1844/45 for the opening of the line. The old station house was built in a Jacobean style and features lots of ornate stone masonary. With LNER A4 Gresley Pacific 4-6-2 No.60009 Union Of South Africa standing in front of the old building I have changed the photograph to black and white to make the image more dramatic. I took the photograph on the 16th September 2017 when the Nene Valley Railway was holding its annual Autumn Steam Gala. 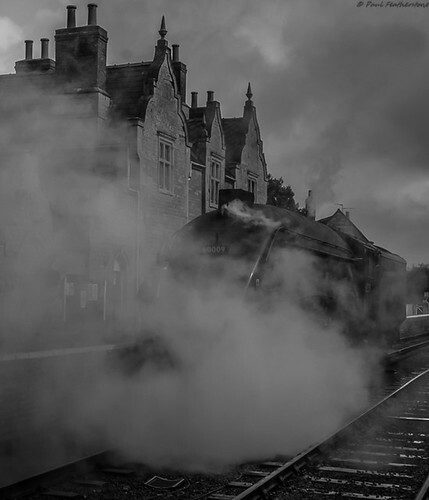 I am sure the old station building makes a good back drop for the heritage railway at Halloween. For me the Jacobean building reminds me a lot of the Adams Family tv series and The Munsters.